Team up members of Blind Guardian and Iced earth, and you're bound for some serious metal, and Demons and Wizard's sophomore effort is exactly that and a whole lot more. This ten track endeavor is laden with all of power metal's staples, from the anthem-like feel of the title track, to the savage riffs displayed on "Terror Train," to the inspired cover version of the Zeppelin classic "Immigrant Song." Providing a head exploding experience for fans of both band's and of the genre in general, "Touched By the Crimson King" is a power metal fan's wish come true. For more information visit the Demons & Wizards section of the Iced Earth home page at http://www.icedearth.com/dw/. Fans of Iced Earth and Blind Guardian rejoice! Jon Schaffer and Hansi Kursch, a very talented duo, have finally collaborated to make a powerhouse CD as Demons & Wizards. Schaffer and Kursch met when their respective bands toured together in 1990; having kept in touch over the last decade they realized they meshed well as songwriters and always hoped to do a side project together. The self-titled debut of Demons & Wizards is the result of their shared influences and complementary songwriting; the creative energy of Demons & Wizards can only strengthen the burgeoning power metal movement. The fantasy and medieval imagery does wonders for Demons & Wizards' overall approach. The lyrics deal with people's deceitful intent, genocide that uses religion as its excuse, the not-so-accurate handiwork of Grim Reaper, reincarnated souls tormented by their unknown past, and a certain fatalistic view of humanity. In nearly every single lyric, there's enough vagueness to make the words hide in literary shadows where meanings are never quite what they seem. Schaffer and Kursch, admired the world over, are unencumbered by their current bands' work and forge forward with classic metal for the masses. Since Schaffer did the primary songwriting this disc sounds a lot like Iced Earth, but Kursch's agile vocal abilities add a great twist with chanting and choral elements. I am personally enamored by the natural combination of American and European influences that Schaffer and Kursch bring to Demons & Wizards. Highlights include "Heaven Denies," "Fiddler On The Green," "Winter Of Souls" and "Gallows Pole." The rest of the tracks are superb as well; in fact, there are very few weak points at all. One striking feature of "Demons & Wizards" is Schaffer's numerous passages of acoustic guitars - the warm tone of the acoustic guitars gives Kursch a surprisingly effective platform to demonstrate his vocal abilities. 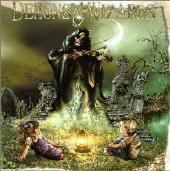 If you like power metal, then Demons & Wizards is a "must have" for your CD collection. "Demons & Wizards" was produced by Jim Morris with Schaffer and Kursch; as with all things even remotely associated with Jim Morris the production is superb. All the songs were written by Schaffer and Kursch. 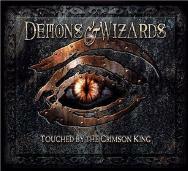 Demons & Wizards is Jon Schafer of Iced Earth on rhythm/lead guitars and bass, Hansi Kursch of Blind Guardian on vocals. Schafer and Kursch are joined by Mark Prator (Iced Earth) on drums. Jim Morris lands a guest spot on lead guitar on a few tracks. Copyright � 2005 by R. Scott Bolton. All rights reserved. Revised: 15 Jul 2018 12:47:51 -0400.